This is a dream come true for as many Nokia users that want Nokia to shift to android operating system because Nokia has just finally announce their first android phones which are Nokia X, X+ and XL. Nokia which is currently running on Microsoft operating system also known as windows phone (owned by Microsoft) but has finally decided to have a taste of the android market. 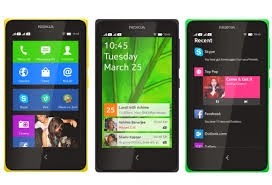 Nokia CEO at the mobile world congress unveiled Nokia low end Smartphone’s, the Nokia X, Nokia X+ and Nokia XL. These phones will maintain an interface that look like windows phone interface with Nokia’s flavor on it while they run on android OS and so will not compete with Nokia Lumia. The new Smartphone’s are built on android 4.1 Jellybean operating system open source version and it’s designed to satisfy the needs and desires of Nokia android thirsty users that are ready and eager to have a feel of Nokia’s new android Smartphone. Nokia will maintain almost all Microsoft services including the Bing search engine and their map and as a result Google’s play store will not be included in these new devices. If these Nokia X series become successful, am very sure that Microsoft will increase production to make more sales and increase profit. Feel free to use the comment box below and tell us what you feel about this new Nokia X series Smartphone’s and don’t forget to share it with your social media friends.